Is the Turquoise Coast a Real Gem? ﻿﻿﻿﻿Is the Turquoise Coast a real gem? Yes, as long as Turkey prevents over-development and over-commercialization. 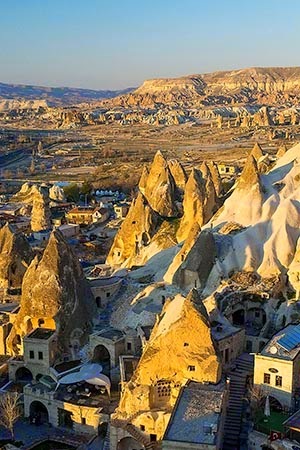 The Turquoise Coast has golden beaches, turquoise waters, ancient ruins, and hospitable guest houses. 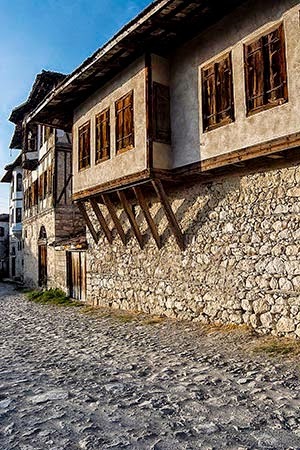 Even if you have other priorities, travelling along at least part of the coast should be included in your Recommended Turkey Itinerary. It is day 14 of our big trip and we finally make it to the southern Turquoise Coast but only parts of the road are right along the sea with glorious views – there is something special about island-studded bays. But there are very few pullovers and even when there are, there are no advance warnings. So this makes photography challenging. The word Turquoise sounds like French, which it is, but it actually means Turkish. 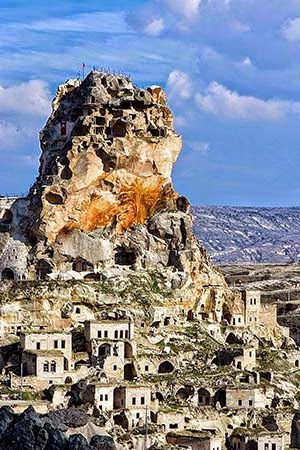 Although the gem came from Central Asia, the Silk trade routes ended in Turkey. As described under the Ottomans and the Topkapi Palace, the Turks were not from Turkey! They were a horse riding tribe from Central Asia so they were familiar with the widespread belief that turquoise had the power to protect riders from injury due to falls. 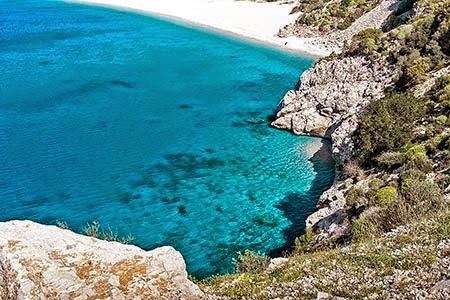 So it is fascinating that the colour of this coast and the gem turquoise are a major influence of Turkey not only on the west but also on the east. We saw many priceless Turquoise necklaces worn by women in Ladakh on our trip to India and the Annapurna Circuit Trek in Nepal. It served not only as a symbol of wealth but as an actual bank account in ancient times. Yes there is not a single soul in my photos. I did not wait five hours to take each photo. It was off season but also the sea is too cold to swim in the spring. For off-season swimming come in the fall. The Mediterranean has warmed up all summer. 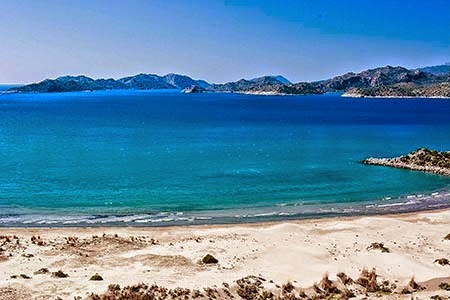 ﻿﻿﻿The famous turquoise peninsula in the distance below is a national park and the entry fee costs as much as the major archaeological sites – I didn't know it costs so much to maintain a beach. There also is a public beach all along the town with easy access to bars and restaurants. There were no tourists today but it would be unbearable in the hot summer. The other reason to come to Ölüdeniz is to use it as a base for the surrounding area. We personally chose to use the more laid back Kaş as our base. Others may prefer an even less commercialized place like Patara. 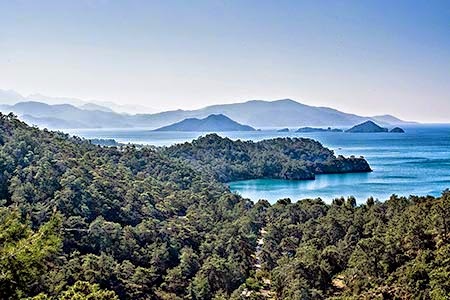 If you want bars and night life or to vacation in cities, then stay in Fethiye or Ölüdeniz. Chaque à son gout – it all depends on your preferences. Ölüdeniz is also the starting point for the Lycian Way, a long distance hiking trail that skirts the mountains along the Turquoise Coast. Or you could just do parts of the trail as day trips. The first segment of the Lycian Trail leads to a view above the Ölüdeniz beach and Kayaköy, an abandoned Greek village. 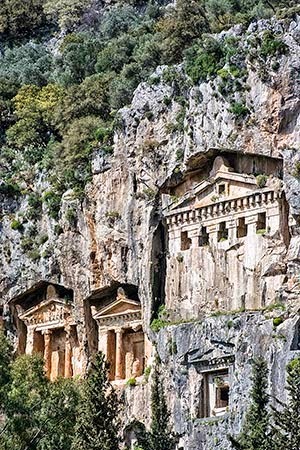 There are Lycian Tombs all over the region of the Lycian Way, including right in Ölüdeniz. 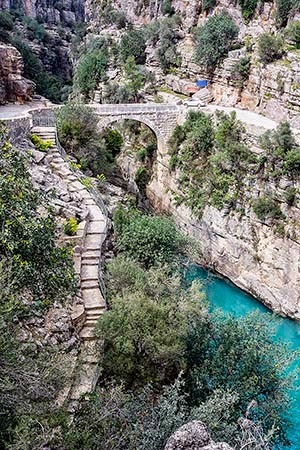 There is a mystical aura around the Lycian Way. 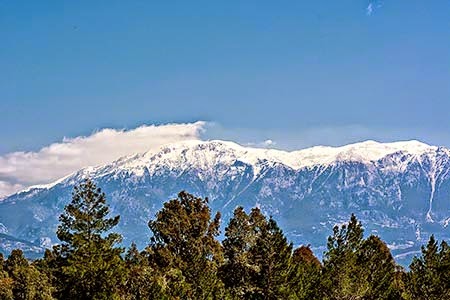 We know so little about the Lycians other than they lived here around 400 BC. But where did the Lycians come from? We actually do know that! 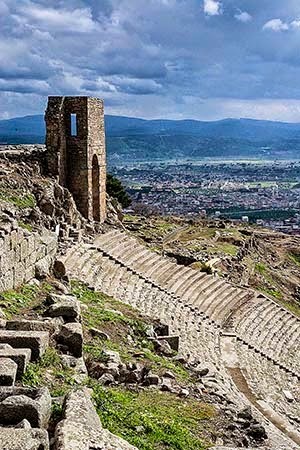 The full story is revealed in Dalyan and the Lycian Tombs. 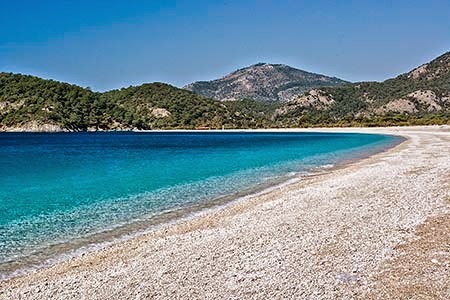 The Ölüdeniz beach has lots of pebbles and lots of tourists, so what are the alternatives? We have already seen an equally scenic and sandy Iztuzu Beach, Dalyan (Day 13). 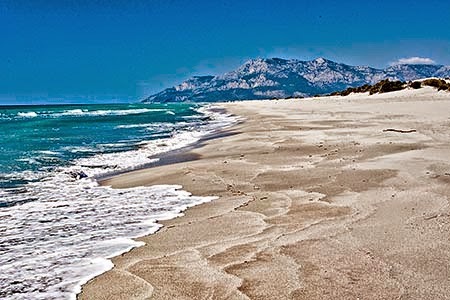 One of the best beaches along the Turquoise Coast is at Patara with its wide stretch of soft golden sand. This is a world-class beach. 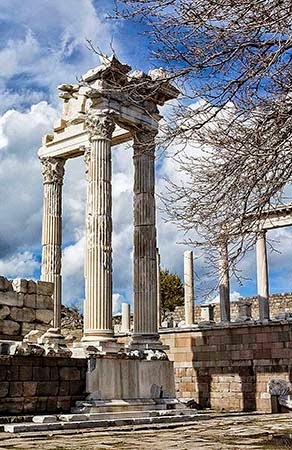 It is protected from development from the ruins of a an important Lycian city, an archaeological park. So if you do not have a car you have to walk to the beach but it is a beautiful and peaceful stroll. The Lycians also did something quite remarkable that we still do today. But that story must wait for the next post on Patara.